I am not sure if the road to the Smithsonian is paved with good intentions, but I can say that we finally intend to do something cultural today. Given our previously stated intentions, it's about time. And no, we have not seen a single movie yet. I blame the first season box set of Farscape, which we received for Christmas. And by the way, it's official: Our Hero is a straight-A student coming out of his first semester. Whee! It's a good thing that a vocal portion of the population frets quite loudly and often that most of us have forgotten the real meaning of Christmas. Otherwise, I might be in danger of forgetting that I have forgotten the real meaning of Christmas. Happy Christmas - whatever it means to you. When I talk about the misuse of language, I flail and rant. This is eloquent and tidy, but very, very true. Today is Our Hero's last day of work before a much-anticipated (and much deserved) 11-day break. As such, I will probably only be posting Extras for the next week and a half or so. My brain needs a rest from blogging and I want to spend lots of quality time with my brilliant husband (as far as we know, he got A's in both of his classes this semester! In the house of Our Heroine there was much rejoicing). Random Bit the First: we actually watched part of the evening news yesterday. They did a spot on teenagers playing poker. Some asinine woman was interviewed and said that giving teenagers poker chips and cards was as dangerous as giving them guns. I had to turn off the TV at that point. It was that or explode. I couldn't figure out whether I was angrier at the idiot-woman for saying the idiot-thing or the network for broadcasting it without question or argument. Random Bit the Second: Toshie the wonder-dog seems to have sprained his shoulder. We were playing frisbee yesterday. Given the opportunity, he would play until he dropped, but I usually watch him closely for signs of fatigue to ensure he doesn't overtire or get injured. But I indulged him yesterday, as we hadn't spent much time outside when the weather was so intensely cold. I gave him the fatal one-more-throw, and he came back limping. Poor little guy. He's still hobbling about today and I feel guilty. None of this is very Christmassy, but that's all I've got for the moment. Check back occasionally for Extras and have a very happy winter celebration of your choice, Dear Readers. I have never been able to sit through "It's a Wonderful Life" - that is, until I saw this version. (Link is to video with sound. And bunnies. You were warned). It's been a while since I've had a really good rant. What follows may not be a really good rant, but I will certainly give it my second-cup-of-coffee utmost. John Scalzi has posted an invitation to fantasize: if you had the ability to expunge one highly annoying but popular Christmas song from the world, which one would it be? He posits "Feliz Navidad," which is an honorable entry. It has the requisite parasitic catchiness, yet is definitely awful - it will stay in your head, annoying you quite effectively long past New Year's. But I would have to say it is not popular enough, and really, not quite awful enough to make my list. Others on the feedback board ganged up on "Do they Know it's Christmas?" which is another effectively awful tune. "Feed the world/Let them know it's Christmastime." Er... feed the world, let them know it's Tuesday, for crying out loud. Feed the world, let them see next week! But I don't think it has enjoyed enduring popularity past 1984, so it wouldn't make my list either. 2. "Happy Christmas (War is Over)" I may get some John Lennon-loving backlash here, but I can't stand this song. It sounds like someone bleakly going through the motions of optimism. It is, in fact, wrong ("War is over now" - hah). But the crowning achievement of awfulness is Yoko Ono's strangled yowl, aggressively commanding everyone within hearing range to have "A very merry Christmas/And a happy New Year/Let's hope it's a good one/Without any fear." Has the SCA Gone Too Far? Oh. My. God. It is SO COLD. Yesterday it was cold as per normal - a bit damp, settles into your bones and makes you shiver. Typical DC winter weather. We hibernated, made julekage, smelled the dough rising and the cardamom grinding. The fire in the fireplace had a cheery, warm glow. Carols played on the stereo and finally, we packed those boxes up. Overnight, the wind blew up and is now 21-26 MPH and the temperature (not counting wind chill) is ten. Ten degrees. This is not normal DC winter weather. This is Crazy Arctic weather. This is weather that comes with advisories and warnings. This is weather that runs with scissors and may well put out an eye if someone is not careful. I am serious when I say be careful of this weather or your face just might freeze that way. The Name He had Used... was Also the Welsh Word for "Idiot." We have received a lot of packages in the last few days. We have yet to get ours sent out. This is, in common parlance, a Problem. I am often early. When in school, I was often the first person out of an exam. I tended to write papers before their due date. These days, I arrive early to meetings or interviews. However, there is a really fine line between early and Very Late Indeed. Having a worldview that supports the notion that I am a person who arrives early, hands things in before they are due, etc. can also be a problem. Yes, it is true 90% of the time. But when it is not true, it is a rude shock to me and everyone else. That worldview gives you a false sense of security, you see. So, this weekend there is a boatload to do. John and I have to wrap everything, I have a class to teach, and we have to get everything sent out. Despite having broken out the Christmas music right after Thanksgiving, I have the uncomfortable feeling that the holiday has snuck up on me. I like my holidays out there in the open, where I can keep my eye on them, and I like my deadlines met. So I will wish you all a very happy weekend. Hee, get me. I pun. I had thought that waking up with Duran Duran's "Rio" playing in my head was the nadir of silly brain tricks. I was wrong. This morning, I have much better music rolling about under the bedheaded hair, but I don't know all the words. I could look them up, but then that might prolong the brain-infestation, so I have decided to live with, "Joyful, joyful we adore thee/Da da dum da daaaa, dumdum..." etc. Thought the first: I took the Metro into downtown DC yesterday for a networking lunch. The platform at Shady Grove was windy and cold, but the sign said we only had four minutes until a train came and I had Terry Pratchett's Hogfather for train reading. Moving into the sunshine to wait and read, someone said, "Excuse me." I looked up, expecting to hear something like, "Does this train go to the Smithsonian?" or some such thing (reading on the Metro tends to mark you as a probable local and likely dispenser of information). Instead, a gentleman pointed to the novel in my hand and asked me, "Have you read all of his books?" I relate this not-terribly-interesting tale for two reasons. First, I would like credit from my bloggy friends and acquaintances for not saying something rude like, "Bully for you." Because that was what I wanted to say at the time. The second reason is this: if this gentleman had had an English accent and whiter hair, I probably would have done a double-take to the photo at the back of the book. Seriously, this person looked like Pratchett probably did about ten years ago. How strange is that? I have this non-sequitur of a conversation with someone about Pratchett's book, and the non-sequiturer looks like Pratchett himself. There's an Escher print somewhere in there, but I have tympani banging and, "Mumble, mumble, deedle-doo-dah..." going on in my head. Thought the second: I was mildly excited about the Earthsea mini-series on SciFi, until I heard that it it was - er, awful. Then I read what Ms. Le Guin said about it herself here and here. Oh my. Then it aired and several of my friends collectively gagged. It sits on the TiVo, just in case John wants to watch it (he has got a higher tolerance for skiffy trash than I do - the man was actually able to sit through Anonymous Rex). I'll be taking a pass, though. Private Yoga client - for now, laugh yourself silly at National Lampoon's 2004 Safe Toy Shopping Guide. It was 22 degrees this morning when I drove over to my Yoga client's house this morning. Dang. A week ago it was in the 50's. I still hate hot weather, but is it too much to ask to have the cold weather come in a bit more gradually? One blogger's search for the absolute worst in nativity/creche scenes. I have mentioned before that friends of ours have been taking momentous steps recently. Weddings, Babies, and Home Ownership are all currently either here or in the works. Friends across the country and other friends more locally are expecting kids, an engagement recently occurred, and two new homes have been procured (with another settlement on the way). We received a call from Alicia and Guillermo the other evening to come and see their new home. Freshly built, freshly painted, and with the movers yet to come. John and I got to geek out over the great situation and proportions of the rooms, as well as reassure them that the yellow they picked for the majority of the house will, in fact, look far less bright when they have furnishings and pictures up. In a lovely bit of synchronicity, Alicia is a doctor at the hospital across the street, and our local friends who are expecting their first child will be delivering the baby there as well. Like I said, this is great stuff. Our Heroine's Mother reacts via e-mail to Friday's post about holiday traditions. Our Heroine's Mother also seems to be infected by Our Heroine's Third-Person Habit. Or perhaps it was the other way around to begin with. 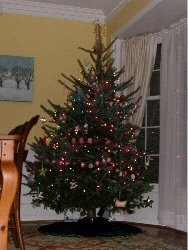 Christmas tree lit and fire in stove. Mom assigns task of grinding the aromatic cardamom to small daughter with blond "dog ears" who is reclining in den watching TV. (Mom wants daughter to have wonderful olfactory memories of the holidays and wants her to be a part of the process. Yes, Mom read a lot of psychology in those days.) Daughter is not so thrilled with any of it. She walks into kitchen with mortar and pestle and, aggrieved, says, "Here. I did it for you. I can't stand the smell of this stuff." Mom thinks, "Oh well, so much for memories - maybe she'll change her mind someday. Who knows?" It appears that she has. Blurkers? Come Out, Come Out! Yes, sorry - I know I am running late today (private Yoga client at 7 AM this morning). Meanwhile, check out this post and if you feel the inclination, reveal yourselves, oh blurkers! I spent a significant portion of yesterday making English Toffee. I think there have only been one or two Christmases in my life when I have not had English Toffee. There's nothing really inherently Christmassy about it, except for the fact that it needs to be cold outside so you can get it to set (yeah you could use the fridge, but I'm not sure any candy is worth a sky-high utility bill). The smell of melting chocolate and caramelizing butter and sugar, together with evergreen, is definitely a Christmas smell for me, as my mother made English Toffee every year at Christmas when I was growing up. At some point, she handed the task off to me, and despite only making this at one time every year, it is something I can practically do in my sleep. Julekage is a Scandinavian tradition, but one that has fallen by the wayside in recent years. John has expressed an interest in learning how to make it (and considering the amount of kneading it requires, two bakers are a good idea). I learned to make julekage from my Norwegian grandmother Erna, known as "Gramie" to her granddaughters. She claimed that I didn't need to learn the recipe by doing it with her: everything I needed to know was on her recipe card, but I insisted on making a batch with her, to get the feel of the dough, the timing and the rhythm of the rising. As she gathered ingredients and tools, I sat down to copy the recipe off of her card. "Gramie," I said after a few moments, "Yulekage does have flour in it, doesn't it?" "Well, it's not on the card." I know that when we make julekage this year, I will still hear the delighted hoot of Gramie's laughter. I saw The Fairy Castle in person at the Museum of Science and Industry when I was a kid. I clearly remember wanting to be five inches tall so I could truly explore it. I think I feel the same way now. Despite having lived up to his name recently, Dash has not bothered the Christmas tree at all. This is a relief, because we caught him streaking through the house last week with one of my "Rudolph" finger-puppets in his mouth ("Look Ma! It's perfectly mouse-sized!"). It was nice to know that he has good taste in abuse victims, though: he selected that sadistic little freak Hermey as his prey. I would hate to think of him going all jungle cat on Rudolph or Bumble. I am halfway through writing my Christmas cards. For those of you who know me, you can get up off the floor now. For those of you who don't know me, it has probably been about five years since I have sent any Christmas cards out. Previously, I could excuse myself on account of "being busy." This year, I have no such excuse. I have only this to say: next year my excuse will be, "Even I can't read my own handwriting." Whether or not this year's batch will get out now depends on the purchase of postage. My Christmas cactus is actually in the spirit. It has one, perfect, pink bud pointing at the sunshiny window. Dang. I need to get my paperwhites going. I have noticed that nobody asks me what I want for Christmas any longer. Since everybody has asked me what John wants for Christmas, I assume that when you get married you don't just gain a partner: you also get a walking, talking Christmas wish-list. Speaking of Our Hero, I still want a pony. Something like this would be nice. Good grief. What would possess someone to get this? On second thought, no - don't answer that... I think I know. Is a gift meant to be remembered as a gift, or do the best gifts sink into our everyday lives with nary a ripple? I do not have an answer for that question, myself. I suppose it depends on the gift, the giver, and the circumstances. Our house is full of the testaments of affection from friends and family. Some are practical enough that they end up just being there. Some are instantly memorable as gifts for highly specific (and often emotional) reasons. And some fall somewhere in between. One of my favorite Christmas gifts nearly made me cry when I received it. A little back story is necessary. Our Hero and I first met and dated about ten years ago. After about a year, we reached what pilots call a "go/no-go point" - the final moment before takeoff where you either fly or abort and taxi back to the terminal to fix something. Ten years ago, we unhappily but necessarily taxied away from one another. But during our time together we had learned certain things about each other: shared interests, common priorities, and a silly little thing: a fondness for a restaurant in Burlington, Vermont that served its house wine in painted Tuscan pitchers shaped like roosters. Skip ahead about six years after our return to the terminal. After losing touch completely for nearly that entire time, I screwed up my courage and called his family to see if we could reconnect. Those shared interests and common priorities were probably still there, and the years might have eradicated the things that drove us apart. Those years might also have given him a wife, a house in the suburbs, and 2.3 children, but the chance was worth taking for me, and my gamble was rewarded. By Christmastime we were a definite item again, beginning to make plans that would eventually lead us to where we are today. That Christmas afternoon he gave me a small, painted Tuscan pitcher, shaped like a rooster. Found Love - Boz Scaggs: funky, bluesy, and it SWINGS. It's not pop, though. Since You Asked - The Singers Unlimited: Hell no. Four voices multiplied into impossible eleventy-million-part harmonies by an insane genius for whom a 9-chord is just the beginning. No. New Hymn - James Taylor: More harmony, sounds like a choir. Beautiful, but not pop. God Only Knows - Jonatha Brooke: A chilly, somewhat eerie, delicate and strangely compelling version of the Beach Boys' classic. Perhaps perfect pop in its original form, but not here. However, if you go to three minutes and one second, you get Stevie Wonder singing "If You Really Love Me" and The Beatles with "Something." Perfect. Don't know if that e-mail is legit? Go phish. Free the Books! Books for Everyone! Not everyone will ever be too old for YAs, and not everyone who gets too old for them will ever get old enough for them again. For some reason, this eloquence conveyed the concept which had eluded me. There is a certain unselfconsciousness granted to many children - their curiosity is allowable because they are young. At a "certain age," however, some seem to feel that they have crossed a line which cannot be crossed again. The things of childhood are forever gone. To those who have just crossed that line, there is no possibility of saying, "I'm going to read what I like." It is ironic - children often express the wish to be a grownup so they can do exactly as they please (being blissfully unaware of the constraints of jobs, mortgages, and other sundry responsibilities), but as adults they disallow themselves one of the things that is truly open to them. It is as if they are afraid that someone will come along and revoke their grownup's membership card if they taste of the delights of Philip Pullman, E.L. Konigsburg, Lemony Snicket, or even J.K. Rowling. But if you cross that line, there is another line that can be crossed - at a certain age, you can choose once again to lose the self-consciousness that keeps you from trying something unhelpfully labeled "For Ages 12 and Up." You can read exactly what you please - you are a grownup, after all. A subversive take on the science textbook disclaimer sticker. It's His Year, I'm Just Living in it. "Compromise:" it is the advice of choice in the sage tomes of marital wisdom. (Other top-ten hits are: "Respect," "Hard work," and "Don't Steal the Covers if you Value Your Life.") Compromise is one of those things that sounds easy - the action is generally not one that requires a lot of physical or mental effort. What it does require, though, is id-squashing: suppression of that powerful, primitive, "I DON'T WANNA" response that can be more difficult than physical or mental effort. Sometimes, the compromise leads you to something more interesting or meaningful than you would have achieved under your own decision-making steam. Sometimes you just squash your id, grin, and bear it. 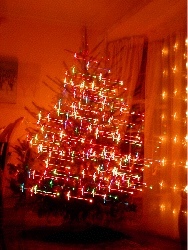 So, I give you my id-squashing of the season: the colored lights on the Christmas tree. Our Hero likes the colored lights. Me, I'm a white lights sort of gal myself. I must, in all fairness, note that this is our fourth Christmas together and the only one so far where we have had colored lights on the tree. The original plan was to go every other year with colored and white lights, but we didn't have as many colored lights as we thought the first time we went to put them on the tree, then forgot to buy them again the next year (why are you looking at me like that? 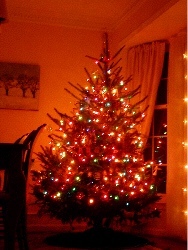 It's not my responsibility to remember to buy the colored lights!). It had white lights, too. John Scalzi's 10 Least Successful Holiday Specials of All Time. Fear my retribution, for it is swift, cold, and set to snappy music. I went on a TiVo Rankin Bass search-and-record mission yesterday, instructing the TiVo to do my bidding and search out all the cheesy Christmas puppet specials it could find. I was looking for puppet-based animation of the 60's and 70's, voiced by the likes of Mickey Rooney, Fred Astaire, Shirley Booth, and Danny Kaye. I was looking for elves who were kinkily into dentistry, forest animals who nodded their heads in time to the music, the epic battle between heat and cold personified, a snowman who dresses like Tom Wolfe, and a certain adenoidal reindeer who crows, "She dinks I'b CUUUUUDE!" An impostor snuck into the mix. Beware the title, "Rudolph The Red Nosed Reindeer and the Island of Misfit Toys." About 30 seconds of icky, computer-animated, derivative crap was all it took to make Our Hero and me recoil in horror. (They even have frightening baby seals in the intro to this disaster - who knew baby seals could be frightening?) The main (and some supporting) characters are easily recognizable in this intro, but everything is too smooth, too shaded, too 2001 to be the Real Deal. Those of us who remember sitting in excited wonder, footie pajamas a-tremble, waiting for the year's only viewing of the Rankin Bass specials will most likely be gravely disappointed. How Does that Sound, Idiot-Boy? Ze Frank's guide to internet punctuation. (Link is to movie with sound). I have already confessed to embarrassing myself (at the tender age of three) with misunderstanding the lyrics of "O Come, O Come Emmanuel." Odd, perhaps, that it is one of my favorite holiday tunes. I have a special fondness for Christmas music that has that hollow, ringing sound of a group in a large room. It makes me miss the singing in choruses and choirs that I did in my teenage years. Soloists are wonderful, and to have a solo can be a terror of a responsibility, but you can't harmonize with yourself, and I love the challenge of harmony. Listening to a group performing a difficult chord can make me hold my breath, as I would watching a ski racer traversing a difficult run. I have met people who claim they don't hear harmony when it is played to them - voices in unison sound the same to them as voices in harmony. I suppose it is a form of aural color-blindness, and it makes me deeply sad that they can't hear what I hear. If you take my preference for choral Christmas music and harmony together, my Christmas music collection ends up being a bit more limited than the rest of my music collection. I have no affinity for most of the pop retreads of Christmas favorites (don't even get me started on Britney, Mariah, or Kenny G.), and a lot of the excesses of modern R&B leave me cold when applied to holiday tunes (even if they do have fantastic harmonies). The classics of many American holiday music collections (e.g. Perry Como, Bing Crosby, or Nat King Cole) weren't something I grew up with, so even though most people regard them as the essence of the holidays, I can take them or leave them. There are a few newer discs in my collection and I am always interested in hearing the latest, but I suspect my favorites will remain fairly set and settled in the old choral mode. It's December first, and I can feel the breeze of a million advent calendar doors swinging wide. I love this time of year. 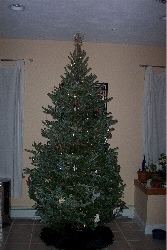 I love Christmas trees, claymation Rudolph, holiday carols, sneaky secrets, velvet holiday clothes, and twinkling lights. I am not so nuts about the pressure and expectations, the massive outlay of cash (which we can ill-afford this year), and the endless, relentless toy commercials (we are spared the last this year by lovely TiVo). I don't usually mind the shopping, because yes - I am one of those people who shops all year long for gifts. I admit it. This year I am less organized than I have been in other years - I have bypassed many of the things I would otherwise have snapped up throughout the year and stashed in the closet in my office (repository and holding tank for gifts to be given). It stinks - I love giving gifts. But, people always say they would simplify if they could. I can, I have to, and I will. And it will still be Christmas: there will still be trees, claymation Rudolph, holiday carols, sneaky secrets, velvet holiday clothes, and twinkling lights.